I've had this book sitting on my bookshelf for a LONG time! Our pastor recommended it to the congregation some time ago. I bought it, intending to read it during the time he was focused on the subject of the Holy Spirit (not that he isnt' focused on the Spirit now, mind you, it's just not the central focus of the sermon series at present). Naturally, I'm way behind. He's off and running and recommending other books that I refuse to buy until I'm caught up on my reading list. Anyway, here I am. I've read the book. I have to say that my denominational background caused me to ignore writers/evangelists like Billy Graham in the past. I was skeptical about the merits of this book. I'm sure some of y'all are curious as to what would make me avoiding something by Billy Graham in the first place. Oh well. I did. And I really don't have a very good reason. I suppose I thought that someone who focuses on the Gospel message (somewhat solely) probably wasn't writing thesis work on any particular doctrinal subject. I don't know how some would classify this particular work by Graham, but I found it solid, balanced and useful. Never for a moment have I doubted in God's being three-in-one. I'm very firmly convinced of the Trinity's existance. God says He is three and yet one. It is a mystery and I'm not pretending to have full understanding. Yet I believe. He is a triune God. If He is not - then He is a liar. Since I know that's not possible, then the only possibility is that He is exists as three (YET ONE!). Perhaps the best method is not to dwell on the particulars of how that works. It is rather mind boggling. Yet it strangly makes sense. Faith takes a person a long way. As Martin Luther once said, "Here I stand. I can do no other." I'm not writting this review to explain the Trinity. I'm writing about one of the parts and He is a part that I'd spent most of my life (until recently) ignoring. But how is that so? If I've always believed there are three parts to God's being then why am I ignoring one? He is a jealous God, is He not? He wants our full, complete attention to all three parts. However, I've discovered its very easy to ignore the Spirit because He is just that - a Spirit! That sounds fanciful and somewhat dismissive. I am now firmly convinced that He is not, will not, cannot be easily dismissed. To ignore is to grieve or offend and scripture clearly states that that is the ultimate sin. I cannot continue to ignore His presence as something confusing that I do not understand. He is in me; He is my helper; He is my chief friend. I cannot walk away from that any longer. I am sorry for the past. Graham focuses on the Spirit's existance - pointing out His importance to believers. Graham caught my attention and made the Spirit feel more real to me. (Not that I need to feel that the Spirit is real in order for Him to be so, you understand. If there is any question about the matter - it is my own fault.) I think this is a fascinating book. Talking about the Holy Spirit is not really the norm in most churches. I am blessed to be a part of a church that desires to acknowledge this Great Helper. My spiritual eyes have been opened and my heart stretched to see beyond the box I had placed myself in. This Person can give people the willies at times. He's so mysterious. 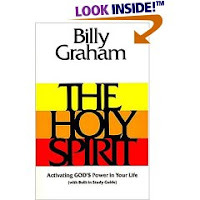 Graham does a good job of focusing his reader on the solidness of scripture and the Spirit's work in individual lives. In this book, Graham seeks to unite Christians on the topic, carefully guarding everyone's convictions, while offering food for thought. It's not an easy work. It is not something basic (while at the same time - it is!). This book challenges the believer to explore their individual relationship with the Spirit. It requires an open heart and an open mind. I'm not saying I'm all there just yet. I am saying I'm willing and I'm very thankful that someone like Graham took the time to explain things in a fairly easy-to-understand manner on a topic that is far from understood! What great thoughts and personal "confessions." The Holy Spirit is such an awesome part of who God is in and for us. I am considering if I should read this book, your comments are very useful. Thank you for the review. sadly, Billy Graham insults those of us who don't believe in a trinity.....it's not biblical. Graham calls us unlearned and falls just short of calling us stupid...like I say, very sad.